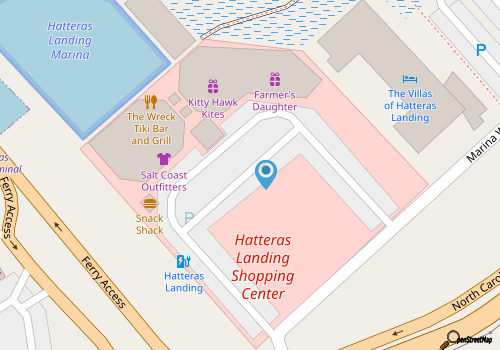 Hatteras Landing is a full-service marina and complex that includes shops, eateries and luxury rooftop residences - all in one. The closest marina to the Gulf Stream, it offers more time for fishing, inshore and offshore, with less time needed for travel. The marina’s charter fleet provides full and half-day trips, and their year-round service is known worldwide for its Bluefin Tuna fishing during the winter months. The fleet also customizes options for anglers who wish to target a specific species of fish.. Above the complex of boutiques and restaurants are luxurious living quarters featuring breathtaking views of the Atlantic Ocean and Pamlico Sound. Available for 3-day minimum stays are ten spacious resort residences that sleep four to six people and range in size from 1400 to 2200 square feet. All are fully furnished and come with GE appliances, including washer and dryer, and housewares. Specialty shops at the Landing feature nautical gifts, lighthouse collectibles, local photography and art, beach apparel, kites and toys. Among the eateries are an ice cream shop, a Mexican restaurant, a tiki bar and a deli located at the Marina Store. Activities available at the site include paddleboarding, kayaking and ecotours, kiteboarding, a climbing wall and bike or moped rentals. Surrounding the community are a playground and extensive boardwalks leading to the ocean and the sound. Nearby are the Graveyard of the Atlantic Museum and other historic sites and attractions.